Asheboro- Michael O’Neal Key, Sr. age 68, of 315 Greenlawn Drive, Asheboro, passed away peacefully on Monday, December 3, 2018 surrounded by family and friends at Randolph Hospice House. A memorial service will be held to celebrate Mike’s life at Central Carolina Community Church in Asheboro on Friday, December 14, 2018 at 2 pm. Mike was born on August 15, 1950 and was a native of Randolph County. He was a caring husband, father, brother, and friend. As a husband, Mike was kind, supportive, and loving. He was devoted and loyal to Janet, his best friend and wife of 38 years. They shared many precious memories, but were most recently fortunate enough to travel and enjoy retirement. It was rare to see Mike without Janet by his side and when they would part they would say “see ya” so as to never have to say “goodbye”. As a father, he offered unconditional love and support, a priceless quality in a parent. Mike was happy to be with his children, be it cooking with and working alongside of Mary-Belle, visiting with Mickey and enjoying a BBQ sandwich, or attending church with Jennifer. Mike was the proud grandfather to 18 grandchildren and six great-grandchildren with another great-granddaughter expected in early 2019. He was the owner of Paw-Paw’s Place and he was affectionately known to many as “Paw-Paw”. Having worked in the restaurant industry his entire career, Mike’s dream was to open a restaurant of his own. In 2007, that dream became a reality. 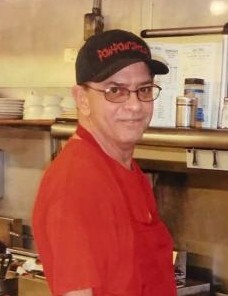 Whether serving a famous “Paw-Paw’s Burger” or joking with loyal customers, Mike was always smiling. He loved nothing more than to cook a meal for someone and sincerely enjoyed every interaction he had with his customers. He is survived by his wife, Janet Key; daughter, Mary-Belle Simmons and her husband Brian of Staley; son, Michael Key, Jr. of Lexington; daughter, Jennifer Foreman and husband Stewart of Asheboro; his grandchildren and great-grandchildren. He was preceded in death by father, Ernest Cornelius Key; mother, Celeste Royals Key; and brothers Joe Keye, Wayne Key, and Van Key. In lieu of flowers, donations may be made to Randolph County Hospice. The family thanks Randolph Hospice House for the excellent care that was provided to Mike in his final hours. Services entrusted to Midstate Cremation & Funeral Service.